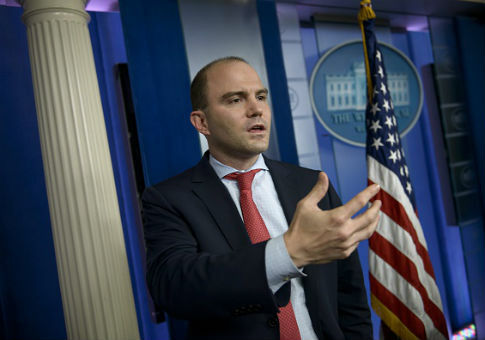 Former top Barack Obama White House aide Ben Rhodes is joining MSNBC and NBC News as a political contributor. MSNBC's media relations team tweeted out the announcement Saturday, saying Rhodes would make his NBC debut on Sunday on "Meet The Press." Rhodes' official title in the Obama administration was Deputy National Security Advisor for Strategic Communications, and he played key roles in numerous foreign policy decisions. He took heat in 2016 when he boasted in a New York Times profile of creating an "echo chamber" to sell the Iran nuclear deal and mocked Washington, D.C., reporters. Rhodes joins former Obama press secretary Josh Earnest in a contributor role at the left-leaning cable outlet. He is an outspoken critic of the Trump administration, frequently tweeting broadsides at the White House. Rhodes is set to release a memoir, The World As It Is, about his time in the Obama administration. The New York Times reported on excerpts of the book this week describing President Obama's private, angered reaction to Donald Trump's election victory. Rhodes has also been widely mocked in conservative circles for his depiction in the HBO documentary The Final Year, which featured behind-the-scenes footage of him and other key Obama foreign policy figures in 2016. At the end of the film, he is shown struggling to find words to convey his horror at Trump's victory, which he predicted throughout the documentary wouldn't happen. This entry was posted in Politics and tagged Ben Rhodes, Donald Trump, Iran Nuclear Deal, Josh Earnest, MSNBC, NBC News, Obama Administration. Bookmark the permalink.